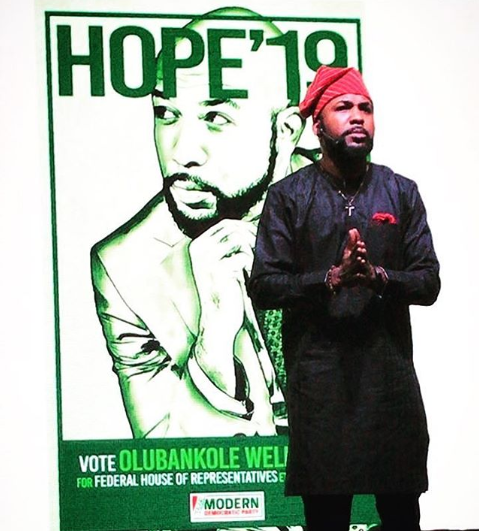 Popular musician and actor, Olubankole Wellington will run for the position of House of Representatives in the 2019 presidential election. Wellington, popularly known as Banky W made this public Saturday night when he was declared as the flagbearer of the Modern Democratic Party (MDP) for Eti-Osa Federal House Of Representatives. BREAKING: @BankyW throws his hat in the ring as he declares for Eti-Osa Federal House Of Representatives, 2019. Speaking on his decision to contest, Banky W, in a post on his Instagram page noted that, “They said we don’t have the money to run.. we say we our strength lies in our numbers. They said we don’t have the structure, we say we will attempt to build it. They said “what if you lose”? I say, what if we win?